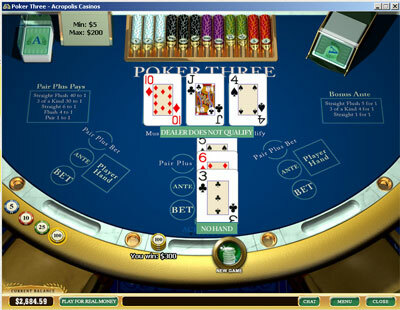 Poker Three contains two games in one. You may bet on one or both games. - Click on a chip of desired value to select it. Then move your cursor to the middle of the screen over the area �Pair Plus Bet� and click on it. Every click on the area adds one chip to the bet. Select another chip if you wish to increase the bet by some other amount. Right clicking on the area removes one chip. - Click the Deal button. - You receive your hand and your winnings, if any. Click New Game to start a new game round, then Rebet, to place the same bet as in the previous round. - First, place an ante. This is done just like placing a Pair Plus bet, except you click on the �Ante� field, not the �Pair Plus Bet� field. - After viewing your hand, decide whether you want to Fold (and lose your ante) or Call (place another bet that equals your ante and see the dealer�s hand). Click on either Fold or Call button. If you fold, you also lose your Pair Plus Bet, if one was made. However, if your Pair Plus Bet paid anything, it is not likely that you want to fold. Please note: Aces play both high and low to a straight. Straight beats flush as there are fewer ways to make a straight with three cards. - Click New Game to start a new game round, then Rebet to place the same bet as in the previous round.